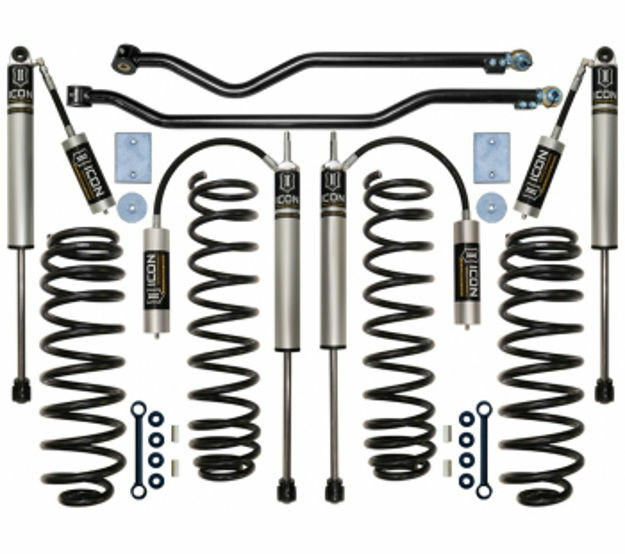 The ICON Vehicle Dynamics 3" Lift Suspension System is designed for Jeep JK owner's demanding the ultimate in performance and ride quality, without the larger stance you find in bigger lift systems on today's market. ICON's Jeep Wrangler JK 3" lift system is engineered with front and rear dual rate progressive wound springs which is the foundation for on and off road performance and suspension articulation. The dual rate design gives you a softer initial rate for superb on road comfort and a firmer than stock secondary rate that increases during compression for excellent bottom out control. ICON V.S. 2.0 Aluminum Series Remote Reservoir shocks add the finishing touch with OE mounting, aircraft grade components, and vehicle specific valving. Remote Reservoir shocks are great for additional heat disipation to prevent shock fade during off road use. Together the combination of ICON dual rate coils and V.S. 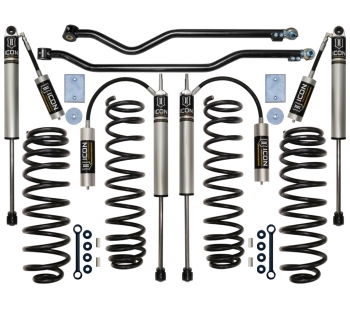 2.0 Aluminum Series shocks adds 30% more wheel travel over stock, helping you rock crawl safer or soak up larger terrain at higher speeds keeping those wheels on the ground. In this Stage 3 system adjustable track bars are include front and rear for optimizing axle position to ensure your axles are perfectly centered under the vehicle. This ICON 3" JK lift system is designed from the ground up to give the 07+ Jeep Wrangler JK's the best performance, suspension handling / ride quality, and clearance for 33" tall tires (35" tall with installation of aftermarket high-clearance fenders).